President Trump signed an executive order Thursday stating that federal research grants will be withheld from colleges and universities that are hostile to free speech. The move comes on the heels of a promise the president made at CPAC, the nation's largest conservative political conference earlier this month, that he would act on what many consider a growing problem of the suppression of ideas on U.S. college campuses. 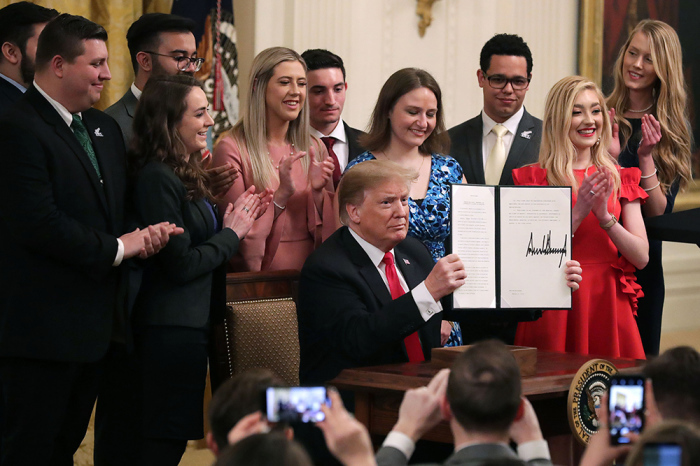 "We’re here to take historic action to defend American students and American values," the president said at the White House signing ceremony, surrounded by conservative students whose free speech had been stifled on their college campuses. "They’ve been under siege," he said of those standing up for free speech, particularly those challenging far-left views. He continued, "Under the guise of speech codes, safe spaces and trigger warnings, these universities have tried to restrict free thought, impose total conformity and shut down the voices of great young Americans like those here today." "We will not stand idly by and allow public institutions to violate their students' constitutional rights," Trump said, adding that if a college or university does not allow students to speak they will be denied funding. "It's that simple," he said. Crystallizing the hostility toward conservative students on university campuses was the recent assault of Hayden Williams, a student activist with Turning Point USA, who was working as a recruiter for the organization on the campus of University of California at Berkeley. In a scuffle that was caught on video and went viral online, Zachary Greenberg cursed at and punched Williams in the face on Feb. 19, giving him a black eye. Police arrested Greenburg, who is not a Berkeley student, on March 1, and he is now facing charges. Williams was present for the signing ceremony Thursday. According to Inside Higher Ed, the order directs federal agencies to make sure that universities are abiding by requirements already on the books, but it does not detail how the enforcement of the order is to be implemented. Ted Mitchell, president of the American Council on Education, said the executive order was a "solution in search of a problem." Yet the College Republican National Committee praised the move. "College campuses are ground zero in the campaign by the liberal left to shut down conservative dissent," said Chandler Thornton, CRNC chairman, in an interview with Politico. "President Trump's executive order is critically needed because college and university bureaucrats have absolutely failed to protect free speech on campus." Stanley Kurtz, senior fellow at the Ethics and Public Policy Center, noted that almost every campus already has a "never-enforced rule against shout-downs." "What’s going to happen when a school refuses to discipline a manifest violation of that rule? Kurtz asked in his National Review blog. "Shout-downs aren’t exactly secret. You’re likely to catch the next one on a viral video. Even if regulators would prefer to do nothing, inaction in the face of video evidence will be difficult." Thus, he stressed, the Trump administration's move sets in motion a new, important dynamic on campus. "The administration will either actively enforce the new rule, or be publicly attacked by its base for refusing to do so in the face of obvious violations. In many — perhaps most — cases, university offices of legal counsel will remove unconstitutional policies well before regulators even act," he said. Public universities applying for federal grants would have to show they are in compliance with the First Amendment, which already applies to them; private universities, however, have more flexibility in limiting speech, but would have to commit to their own institutional rules, Fox News reported Thursday.